Et quel superbe vers enten-je icy sonner ? Et le bouc est trop peu pour ta Muse tragique. Le theatre François de ton cothurne antique. La tienne comme foudre en la France s’écarte. De quoy mon petit Loir est voisin de ta Sarte. And what proud verse do I hear ringing out here? And the ram too little for your tragic Muse. French theatre with your antique buskin. Yours, like thunder, rolls forth across France. That my little Loir neighbours your Sarte. As with the previous poem, Ronsard writes here in his usual Alexandrines. They seem appropriate for a poem proclaiming the voice of thunder with which Garnier speaks, and for comparing him with Aeschylus, perhaps the most noble and high-flown of the three great Greek tragedians and the most natural compaarator (in my view) for the French grand style. (By contrast, Shakespeare is comfortable in Sophoclean or Euripidean style, though he can rise to Aeschylean heights when he wants to: French tragedy cannot descend to the commonplace of Euripides, and rarely to the middle ground of Sophocles!) Incidentally this is the first time one of the ancient Greek tragedians has been mentioned in a poem (as opposed to a footnote) on this blog. Having said which, it is pretty obvious that the compliment is over-blown… and Ronsard’s self-deprecation in the final line doesn’t of course stop him making sure we know exactly who has written this encomium! 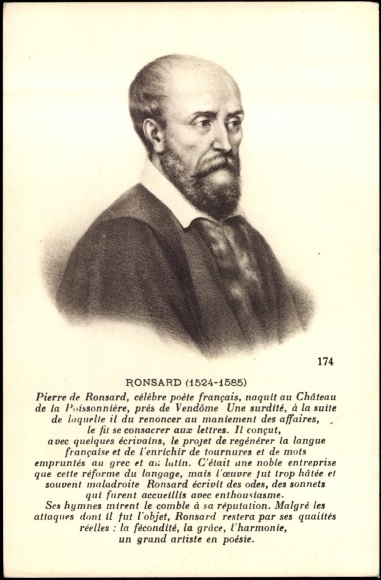 I imagine Ronsard with his tongue in his cheek; and I have to say I like his style here!